The Hotel San Marco , three stars of Riccione, is located in a privileged position on the beach, with no roads to cross. Ideal for families, has free parking, free WI-FI and excellent cuisine from Romagna. No pets allowed. 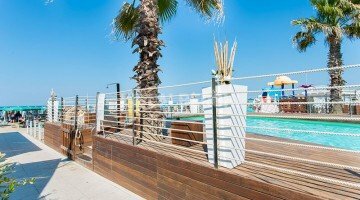 The Hotel San Marco enjoys an enviable position: it is located on the first line on the beach of Riccione, overlooking the pedestrian street that runs along the bathing establishments. The center of Riccione can be reached in a few minutes on foot. The rooms are equipped with bathroom with shower, hairdryer and complimentary toiletries, balcony facing or sea view, air conditioning, LED TV and satellite TV, safe, free WI-FI and direct dial telephone. STANDARD: equipped with all the services listed. On request and upon payment: minibar. SUPERIOR: made with quality materials and custom-made, with more refined bathrooms, minibar. JUNIOR SUITE: they are located in the attic and have a panoramic balcony with sea view, private solarium and more spacious and comfortable spaces, minibar. There is a sea-view garden, bicycles with a seat, a living room with a sat TV corner, a reading room, a lift. In addition, the hotel organizes evenings and theme and offers a shuttle service to the theme park of Mirabilandia. PARKING: external and free or paid garage; both available until places are exhausted. BREAKFAST: set up in the garden, with a wide selection of desserts, bread, cereals, fruit juices and savory dishes. LUNCH AND DINNER: served in the air-conditioned dining room, every day the kitchen offers a choice of menus with dishes of local cuisine based on meat and fish, cooked vegetables, raw, gratin, appetizers, piadina and much more. In the hotel: strollers and bicycles with child seats until exhaustion. On request: pediatric counseling. In the room: cot and bottle warmer. At meals: high chairs at the table, baby food and dedicated menus served at flexible hours. On the beach: playground area and entertainment. At the equipped beach Bagno Lido delle Sirene n. 101-102 guests of the hotel can take advantage of the many services available such as cabins, playgrounds, fenced children's playground area, entertainment for children, relaxation area and fitness. For an extra charge: swimming pool and Jacuzzi. List prices are per person per day in Full Board. ALL INCLUSIVE: Full board + water, wine and soft drink with meals + beach service (1 umbrella and 2 sun beds per room). - Underground parking € 9.00 per day. In room with 2 adults. Ask for a personalized quote. For a detailed proposal, do not hesitate to contact us. - Abundant breakfast buffet, sweet and savory until 12.30. - Tickets for theme parks at reduced prices, in advance, avoiding the files at the ticket office !!! 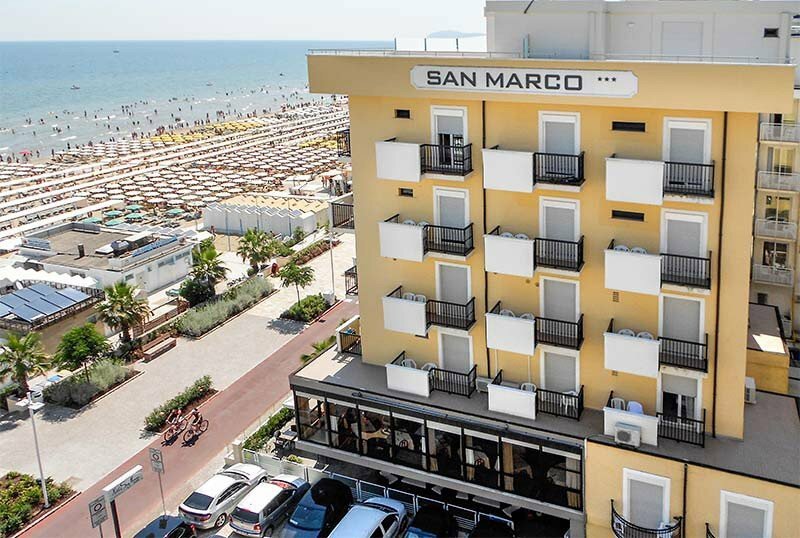 For the 2019 summer season, staying at the Hotel San Marco in Riccione is convenient ..
Prices starting from € 60.00 per day per person depending on the period and the chosen room.